We all want our children to be cavity free, but statistics show that our parents may need some assistance with their family’s dental health. Cavities are the gateway to tooth decay. Tooth decay is the most common chronic disease in the United States—five more times common than even asthma. Unlike asthma, tooth decay and cavities can be prevented! 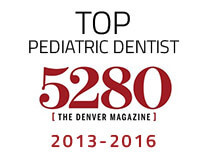 Your children’s dentist in Castle Pines wants to help parents and caregivers brush up on the basics of keeping your little one’s mouth healthy and happy at each stage of their lives. We have also included some tips to make brushing fun again! It’s Okay to Baby Those Baby Teeth! Even when you can’t see them, they’re there. Baby teeth start forming in the womb and before you know it, they will be breaking through your little one’s gums! Keeping your child’s teeth and gums healthy is a part of creating a healthy foundation for your child’s adult teeth to grow into. Also, baby teeth help your child’s development with eating/chewing, speaking, and set the stage for good oral hygiene habits as they get older. 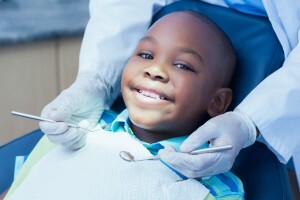 Here’s how to care for your child’s teeth and gums during each stage of their childhood. After each feeding, wipe off your infant’s gums with a soft cloth, or a soft-bristled toothbrush with a small head. You do not need to use toothpaste! Just good old fashioned water and a clean cloth will do and DO NOT allow your infant to fall asleep while nursing or bottle feeding. TIP: Take your time to enjoy this intimate experience. Your child may enjoy suckling on your finger while you clean their teeth. Each morning and evening before bed, help your child brush and floss his or her teeth using a soft-bristled brush with a small head. Use non-fluoridated training-toothpaste until your child is proficient at spitting. Don’t forget to gently brush the gums! TIP: Brush your teeth in front of your son or daughter. He or she will love to practice being just like mommy or daddy! TIP: Kids around this age love playing a role in decision making. Let your child pick out his or her own toothbrush and flavor of toothpaste. They are more likely to brush every day if they are engaged. Most adolescents are able to brush and floss twice daily on their own. Remind them to keep the brush halfway on the gums to remove all plaque and maintain good oral health. TIP: Adolescents love music. Play a song that is two to three minutes long to make sure that they are brushing their teeth for the correct amount of time. With these tips and tricks, your pediatric dentist in Castle Pines will have you and your family on the fast track to optimal oral health. Keep in mind that it is still important to have your child visit the dentist routinely for dental exams and professional cleanings. Contact us today! 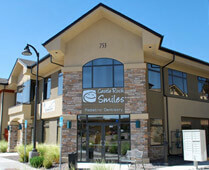 We would be happy to introduce the cool, fun side of dentistry to your child.